This grandiose marble fireplace Grand Richmond has two hand-carved fluted Roman Corinthian columns supporting a tiered decorative mantel shelf. The mantel shelf has a dental moulding detail carved into it. 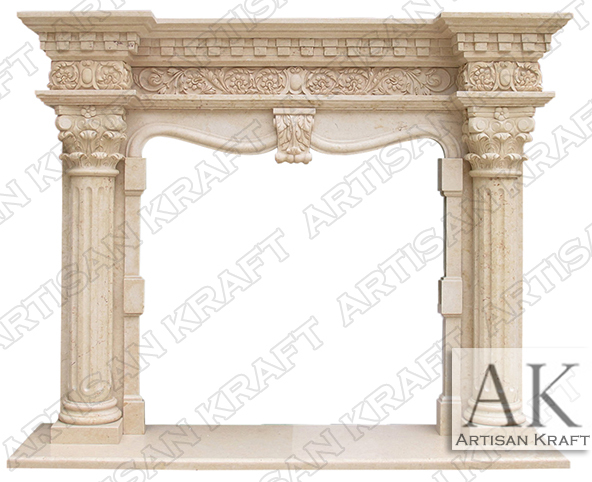 This is a large marble fireplace model with a lot of floral detailing. An Antique fireplace mantel look and design. Looks great in Egyptian Cream Marble. Also available in a four column option. The design is similar to the architectural styles of Richmond, Virginia. Many of the traditional Virginia (VA) designs were inspired by Old World French and Italian styles. Price: The price will vary, please call or email.